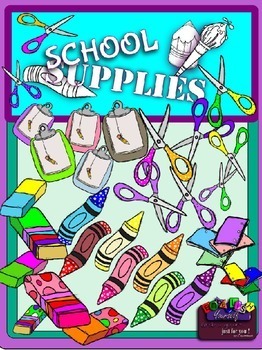 This is a set of school supplies to get you rolling for back to school projects and can be used throughout the year. Bold in color with my unique line style, these fun graphics are sure to please! They are drawn freehand and all 37 graphics are shown in the preview for your convenience. These, combined with any of my other school clipart sets (click the green links below) will make projects that have great eye appeal and will definitely create memories for your students! Included are 8 main black outlines with white fill, 5 clipboards in various colors with pencils attached, 6 bold erasers in 4 styles, 7 colorful polka dot crayons, 9 pair of scissors in several colors, some with polka dots and 2 groupings of notebooks. These will go great with "School Supplies 2" . 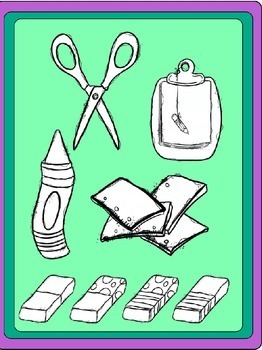 Create many cool, memorable back to school projects by combining any of the following sets. Just click the green links to check them out. -Build up TpT credit by leaving feedback after purchase/download. Go to TPT Credits to learn how to redeem your credits on future purchases! -Stay up to date on my new, unique clipart creations, sales and freebies by following my Teachers pay Teachers store while visiting. Click the green text below to follow the links! -Embellish Yourself images are high resolution and saved in .png format for a crisp, clean result. -All images can be easily layered in your projects. -All art is created especially for Embellish Yourself by r.z. aLEXANDER. -All free and purchased graphics can be used for personal and commercial use. -Embellish Yourself art cannot be commercially used in any graphic design items such as letterhead, clothing, hats, cup/mugs, books, magazines, articles, newspapers etc. -All creations are the sole property of r.z. aLEXANDER and should not be redistributed, copied or reproduced in any way without proper approval. -Products from Embellish Yourself should not be used to create new clipart or used to promote other clipart artists or clipart products. -Products from Embellish Yourself cannot be resold, given away or posted on the internet in any form. -Your cooperation is greatly appreciated! -Have a great day and do it on purpose!